Our company designed and built 11 units in this community. Each unit was distinct in its own way but all averaging 1,800 square feet per unit. 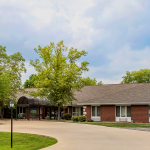 This is a retirement community located in Greenville, Illinois.